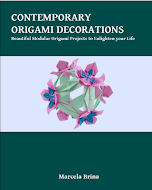 Origami boxes are a nice and personalized way to pack presents. 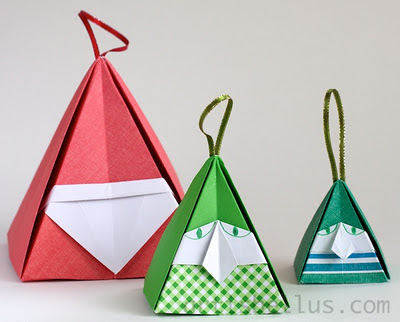 Simple origami boxes are usually folded from one sheet paper for the base, and another one for the cover. Modular boxes use several sheets of paper for the cover and the base to obtain different geometric patterns. The Cat Face Box is a fun model, that can be found in Tomoko Fuse's book, Origami Boxes from a Single Sheet, ISBN 4480872035 (in Japanese). I like this design because, unlike most of the others, it has an irregular shape. 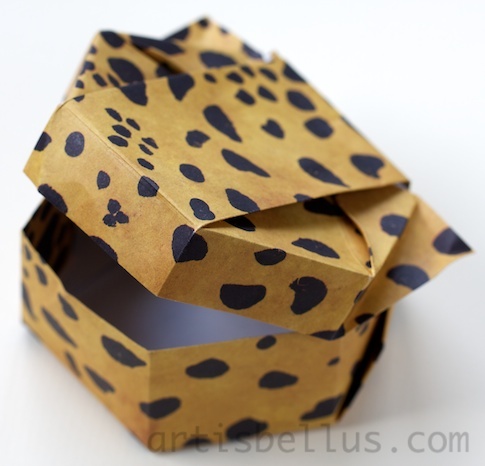 The box resembles a cat face, although because of the pattern of the paper, mine looks more like a leopard. The box is folded from a rectangle with 1:√2 proportion ("A" proportion or silver rectangle) that I cut from a 12" (300 mm) square of scrapbook paper.